Due to current weather conditions, the SoccerDome is closed today, Thursday, 11/30. All scheduled activities for 11/30 are canceled. An updated status report regarding activities scheduled for Friday, December 1 will be issued later this evening. Thank you. Men who play soccer three to four times a week and who wear size 9 shoes are being sought by Reebok’s Human Performance Engineering Lab to serve as product testers. I’m proud to bring you the most recent article by Springfield’s active National Referee, Andy Ellsworth. Andy spent early November in Maryland where he worked the ACC Tournament following his work in several regular season ACC matches this Fall. I asked him if he would offer his thoughts on the experience and if he really wanted to go out on a limb, maybe offer a prediction for the upcoming NCAA College Cup in St. Louis this weekend (weather permitting?) that has Virginia and Wake Forest in the final four. The tournament was held at the Maryland Soccerplex in Germantown, Maryland. I have been here once before back in 2002 as part of the referees for the U.S. Youth National Championships. The referees here for the tournament are from New York, North Carolina, South Carolina, Virginia and Maryland. I have been very fortunate this season with having a couple of ACC assignments. I worked Boston College vs. Virginia Tech at Boston College, North Carolina State vs. Virginia at N.C. State and my last regular season game was between Wake Forest vs. Boston College in Winston Salem, N.C. I was given the opportunity to participate as part of the referees selected for the ACC Tournament from those assignments. I arrived here on Tuesday, October 31 for the play-in game between Virginia Tech and North Carolina State. This game was not very exciting until the 2nd half. It seemed like both teams were sitting back and waiting for the other team to commit and at halftime it was 0 –0. Finally in the second half 7 goals were scored. N.C. State scored 2 goals and seemed to have the game in hand. Virginia Tech started to push and scored 3 unanswered goals to go up 3 to 2. The next minute and a half saw N.C. State score 2 goals to take a 4 – 3 lead. That is how the game would end. N. C. State won the chance to face the #1 seed, the Duke Blue Devils. Wednesday, November 1 is the Quarterfinal round. There are 4 games on tap for today. The first game had #1 in the country Wake Forest taking on North Carolina. The game was scoreless though regulation and extra time and Wake Forest won on shots from the mark to determine a winner (aka Penalty Kicks). I was the Referee on the second match of the day. My game pitted Duke vs. N.C. State. The game was pretty competitive with Duke having everything to lose as the #1 seed and N.C. State with nothing to lose and with a win could possible sneak into the NCAA Tournament with an at large bid. Duke scored first in the 21st minute and controlled most of the play. At the half Duke lead 1 – 0. Twelve seconds into the 2nd half saw N.C. State tie the game up. Talk about catching a team sleeping. Duke would score the game winner in the 58th minute. The topic of coach’s behavior that has been discussed on this site is not just a local issue. In the 73rd minute I sent off the North Carolina State Coach for persistent dissent. The third match of the day had Virginia (#3 in the country) vs. Clemson (#6 in the country). Virginia came out very strong and went up 2 – 0 in the first 20 minutes and that is all they would need to defeat Clemson. Virginia looks like the team to beat. The last game of the day was between Maryland and Boston College. This was the most anticipated match with Maryland being the host school and the rumor of 9 busloads of Maryland students coming to the game. I was assigned as an Assistant Referee for this match. This was a great game with the atmosphere. The game remained tied through regulation and seemed like we would be headed for shots from the mark to determine a winner. But in the 106th minute in extra time, Maryland scored off a shot that deflected off a defender and the reigning National Champions had moved onto the Semi-finals. Thursday, November 2 was a day off from games. This is a day of rest for the teams and the referees. A couple of us went into Washington D.C. for some siteseeing. We rode the train to the Mall area and took in some of our Nations Capital. Friday was the day of the Semi-Finals. I was assigned as the 4th official on the first semi-final game between Wake Forest and Virginia. I was kept busy this match as the game had a large number of cards issued, 11 cautions and 1 send off. Virginia scored an early goal and this held up until 36 seconds left in the game when Wake Forest scored the equalizer. Both teams had early chances in the extra time but could not score. Wake Forest won the game in shots from the mark. The second game had Maryland vs. Duke. There were close to 5,000 fans at the game. Duke scored in the 40th minute on a goal by Joe Germanese (SLUHS). That would be enough to push Duke through to the finals. Saturday was a rest day with some Mall time and viewing of the movie “Borat”. I was assigned as an Assistant Referee for the final between Wake Forest and Duke. The game was non-stop action. My GPS showed that I had run 4.7 miles on the line. Both teams were moving the ball but did not really commit too much and give away an easy goal. The game ended in regulation 0 – 0. The game moved into the extra time and saw both teams with an opportunity to win. In the 6th minute of the first extra time Duke scored on a shot that caught the Wake Forest goalkeeper out of position and went into the side netting. DUKE WINS the conference championship. This was a wonderful opportunity that I was given to be part of such a great tournament. The ACC was able to get 7 of the 9 teams in conference in to the NCAA tournament with 3 of the 4 getting the top 4 seeds. Unfortunately it did come at the expense of a dear friendship and trust of someone that means a lot to me in my soccer family. I hope someday I can build back the trust and friendship I tarnished. I only hope is that I can use this experience to help the up and coming referees in the area as to what is possible with hard work and the love of the game. The Final 4 is set for St. Louis and there are 2 teams left from the ACC on opposite sides of the bracket. It could be an all ACC Final. As you have read up above, the most competitive match of the ACC tournament with Virginia and Wake Forest and Wake Forest winning in Shots from the Penalty Mark to determine a winner (PK’s). My prediction is Virginia winning the Championship. 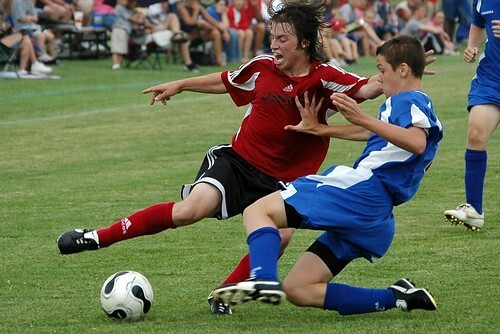 “Devon Newport was chosen to represent the Region II 1991 Boys ODP team and will play with them in the Final 4 Showcase. This is an honor as he has been selected as one of th top 18 players in his age group in the Midwest 14 states. We will miss him in the showcase, but it allows other players a chance to step up and an outstanding opportunity for Devon to compete on that stage” said Jeremy Alumbaugh Director of Soccer Operations. I love getting to use this photo, it’s one of my personal favorites. Devon makes me look like a good photographer anytime I get to shoot him, which I’ll be doing this weekend. The votes are in for the Southwest Region (Districts 5 and 6) which includes the Western area teams in District 6 and our local boys in District 5. These are the Districts that sent teams to the Quarterfinal playoff for the right to represent the Region in the State Final Four.